Sure, the expectations for new brothers are pretty high, but you aren’t required to know everything right away. You have the time and potential to become as great a brother as your ambition will allow. You get to prove what you’re made of, to start fresh. Whoever you were before you were a brother doesn’t matter, and that’s a great feeling. Plus, the chapter has already extended a bid. You’ve gone through the rigors of the rush process. In short, they’ve accepted you. They want you to succeed. Now all you have to do is help them help you. At first, new member training seems pretty straightforward. Memorize a bunch of facts about the founders, chapter mottos, colors and the meaning behind the fraternity crest. Be able to recite Alpha through Omega, like you’re a Greek Sesame Street puppet. That’s pretty much it, right? Simply cramming every page in the new member manual before your initiation doesn’t make you a worthy fraternity man. What makes you a better brother isn’t being able to shout the chapter’s values on command--it’s embodying those values each and every day. 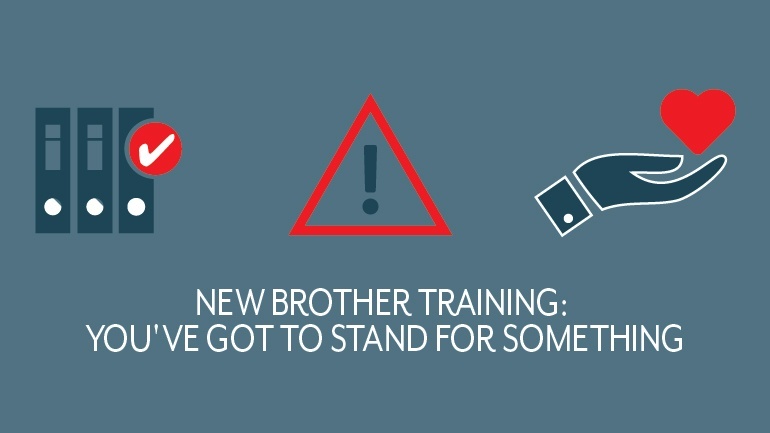 When it comes to new member training, you might be surprised to learn that chapter risk management plays a huge role in building a responsible new class of brothers, placing values at the forefront. Because when you’re in the business of building better men, You’ve Got to Stand for Something. OmegaFi can help. Lesson #1: Safety First with New Brothers. New brothers will chomp at the bit to party with the chapter. They’re understandably stoked about receiving bids and making it through new member education. It’s easy for established brothers to get caught up in the excitement, and this can lead to unsafe behavior. You want to establish a risk-free chapter environment from day one, and it needs to be a central part of your new member education program. You and your fraternity brothers can take a huge step in this direction by converting to a dry chapter. Your chapter’s risk management will benefit tremendously from eliminating the dangers associated with potential alcohol abuse. Brothers who’re of age can still make their own personal decisions, but you’ll take drinking out of the chapter house, and with it many of the risks new brothers face. It also helps established brothers set a better example. At the very least, brothers should run a dry rush and remove alcohol from new member activities. Even without the added risk of drinking, you should educate new brothers about every aspect of chapter safety, coordinating with the risk management chair and house manager when possible. Teach them the ins and outs of fire drills and fire safety in the house, along with any other bylaws and safety procedures. Instill new brothers with core chapter values, with a focus on eliminating risk. Did we mention not to do it? You’ve seen the headlines. Chapters across the country have faced huge consequences from hazing, including chapter suspensions, tarnished reputations, injuries, and in some tragic cases, fatalities. New brothers who witness or experience hazing should feel safe coming to chapter executives, national advisors, university officials or, if they feel threatened, university police. It’s up to the chapter to give clear and direct instructions about anti-hazing policies and to avoid hazing at all costs. In the past, fraternity chapters saw hazing as a form of brotherhood bonding. In fact, it produces the exact opposite effect. Hazing destroys your relationships with new brothers and causes irreparable harm. Focusing new member education on team building exercises and bonding activities--keeping far away from hazing--is a much better way to establish trust. Okay, not really. Anthony Edwards’s and Robert Carradine’s iconic roles as poindexter fraternity men are pure fiction. The film deals heavily in Greek stereotypes. It’s meant for entertainment purposes, not for accuracy. In other words, don’t screen Revenge of the Nerds as part of the new member education program. Still, even in the most lighthearted movies you can find some nugget of truth. The takeaway here is that fraternity men can put academics above partying and still thrive. In fact, your chapter can only succeed if every brother commits to being a student first and foremost. For this reason, place an emphasis on academics in new brother education. Beyond the initial education period, a big brother, little brother program can give new brothers continuing resources and mentorship to balance academics and chapter life. Keeping learning at the forefront helps you manage chapter risk in several ways. Brothers must attend regular study hours, and face consequences when their grades drop below chapter standards. You can take away privileges such as attending social functions and require a baseline GPA for living in the chapter house. Brothers must always strive to be the best students they can be, and any risky, party-type behavior will show up in their academic performance. They may think they can stay ahead of it, but it never works that way. Missing or dropped classes, lower grades and late assignments are all signs that a brother’s more worried about hitting the club than hitting the books. When educating new brothers, tell them flat out that they need to get the grades, or they should go find another chapter. That sounds harsh, but trust us. Taking a hard line about academics will protect your chapter from sinking into a cesspool of risky behavior. How does risk management factor into your chapter’s new member training program? After reading this, are there any changes you’re thinking of making? If not, what do you think our list is missing? Class is in session in the comments below.